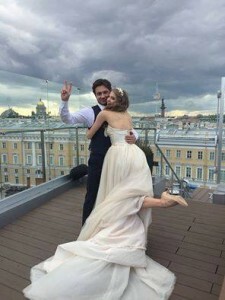 Wedding bells ring out in St Petersburg for Mikhail Tatarnikov, chief conductor of the Mikhailovsky Theatre, and glamorous ballerina Angelina Vorontsova. Angelina bade farewell to her former boyfriend, the Bolshoi dancer Pavel Dmitrichenko, when he was found guilty of organising an assault on the former Bolshoi chief Sergei Filin, who almost lost his sight in an acid attack. Pavel was jailed for six years by a Moscow court in December 2013. It was reported in Russian media that high among his grievances against Filin was the director’s refusal to cast Angelina as the Swan in Swan Lake. If I were responsable for this headline, I would be deeply ashamed of myself.